Massive disruption ahead. You can be blind to it or stare it in the face. Information Age predicts 40 percent of the Fortune 500 won’t survive the next decade. 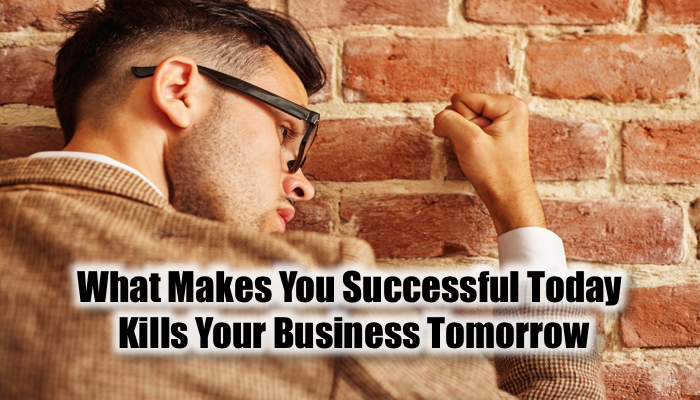 Because what makes them successful today kills them tomorrow. Read on to learn how to survive and serve up disruption while the business dinosaurs fail in ever-increasing numbers. The old business model focused on efficiency, creating systems, processes, and procedures that trimmed away the extra labor, costs, and waste creating a uniform product at the lowest possible cost. This works well when there aren’t many changes in technology, demand, and consumer expectation. Traditional factories were designed and built over years to delivery goods that would be in the market for decades. Those market slots are full and being disrupted at every turn. I’m seeing well-run companies stumbling because they can’t move fast enough to keep up with the demands of their nimble — and fickle — customers. Think about how Dollar Shave Club has wounded Gillette, now scrambling to catch up. Traditional business creates a static system with so much inertia that meaningful change becomes a challenge. People involved don’t want to change, management sees change as risky to their career, and change creates costs and inefficiencies counter to the model hypothesis. And they have plenty of evidence to support their position. Yet, in today’s rapidly moving world, the merely efficient get left behind. Businesses are closing at an unprecedented rate despite all time record highs on Wall Street. If you’re stuck in your processes, you’re at risk of being disrupted, and you won’t detect it until it’s too late. Adapting to ever-changing technology and market demands requires corporate-wide flexibility and a willingness to forgo certainty for uncertainty. Even massive companies must be able to pivot in months if not weeks. The day of an 18-month project is coming to an end. It’s replaced with rapid phased deployments: think lean and agile management methods on steroids. But it takes more than that. It takes a massive culture shift. See the transformation model below. Efficiency requires an expert understanding about “how” to accomplish a task or mission. The better you know how, the more efficient you become. 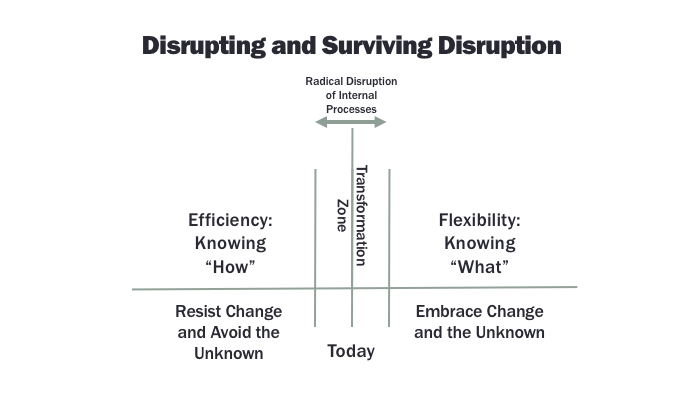 There’s much corporate resistance to change with a tendency to avoid the unknown because of the perceived risk to upsetting the processes and the perceived chaos that results. 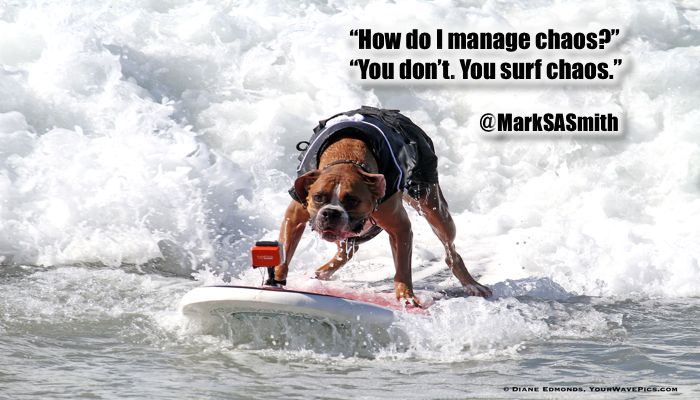 To be agile and flexible changes the focus to “what” has to be accomplished, knowing the what is a moving target. The faster you can identify the “what” the sooner you’ll be able to figure out — or outsource — the “how.” To do this, you and your team must embrace the unknown, considering every day to be an adventure and a battle to be won. The biggest issue with moving from efficiency to flexibility is execution risk: how can you execute when you don’t know what you’ll be executing? This requires a new executive mindset, new tools, and specific people with unique attitudes and skills. Making the transformation from efficiency as a key value to flexibility as a key value demands massive disruption of internal processes, politics, and procedures. It’s not for the faint of heart or the indecisive. Entering the transformation zone requires a complete overhaul of what’s judged as right and wrong, what’s good business and what’s bad business. It’s a complete reinvention of the organization and culture from the ground up. At least of third of the existing companies won’t make the transition, can’t make the transition, and will make every excuse on the planet to avoid the transformation. And we’ll see them on the scrap heap, in the bargain bin, and in MBA case studies. These methods allow rapid adjustment to processes, quickly correct issues, and can allow products to take flight fast. There are lots of great books on the topic, many excellent facilitators, and experienced team members ready to take it to a new level. In my experience, when you make massive transformation, one third of the team won’t make it. It’s too much for them to handle. The sooner you move them on, the smoother the transformation will be. If you don’t, they’ll actively sabotage the transition, and take the company along with them. You probably know who they are. While they are good people providing valuable service in the past, they can’t make the journey to the new world and now can tank the business. One third will be on the fence. The sooner you can win them over, the better you’ll be. Without a solid plan and swift execution, you’ll lose half of them, which may terminate the transition. And one third will be right on board. “It’s about time! I thought I’d have to leave.” These are your transformation champions. Round them up, give them the new direction, and get out of their way. The good news: Millennials already know how to make rapid transformation based on their extensive experience playing video games. In that environment, they’re not afraid to make mistakes knowing that they’ll learn fast and take another shot at another approach. While Boomers and some Gen X may resist this idea, the Millennials excel and will, by default, soon be running the world. If this freaks you out, you’re in for a massive surprise because you’re resisting the inevitable. Stop the culture of “we need more data” and “let’s decide next quarter.” Instead, bring together the brightest new minds and put them into regular scrums so that you can “skate to where the puck’s gonna be.” Take on the mindset of an entrepreneurial startup, willing and able to pivot as you get more intelligence. Get help from those who have paid the “stupid tax” on transformations like this. They know how. I can connect you with experts who have done it before and will do it over and over again. Get more great ideas like this from my weekly podcast, the Selling Disruption Show.